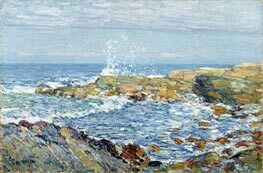 Frederick Childe Hassam (October 17, 1859 - August 27, 1935) was an American Impressionist painter. 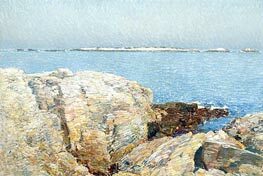 He was born in Dorchester, Massachusetts, and died in East Hampton, New York. 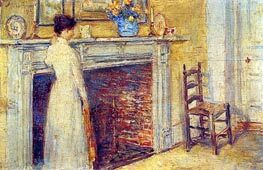 Hassam (pronounced HASS'm; Childe pronounced like child) left high school without graduating, and ended up working for a wood engraver. 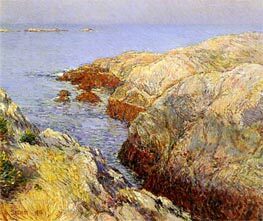 He attended drawing classes at the Lowell Institute, a division of MIT, and was a member of the Boston Art Club. 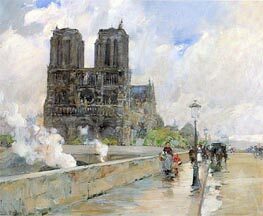 He began his artistic career as an illustrator and watercolorist. 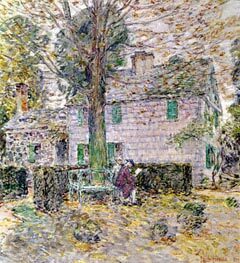 By 1882, Hassam was exhibiting publicly and had his first solo exhibition, of watercolors, at the Williams and Everett Gallery in Boston, Massachusetts. 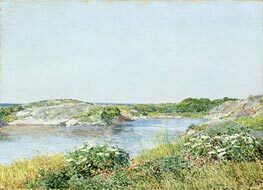 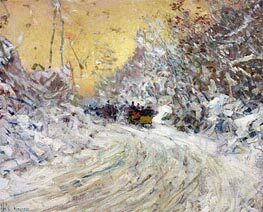 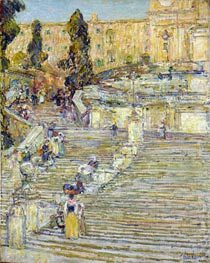 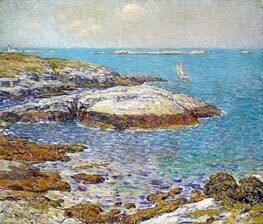 The following year, his friend Celia Thaxter convinced him to drop his first name and thereafter was known simply as "Childe Hassam". 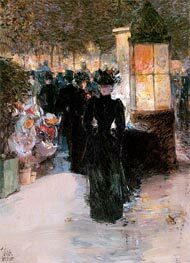 Having had little formal art training previously, Hassam went to Paris in 1886 to study figure drawing and painting at the Académie Julian. 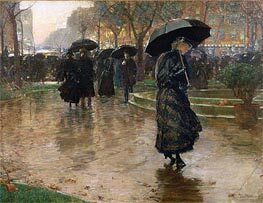 He studied under Gustave Boulanger and Jules Joseph Lefebvre. 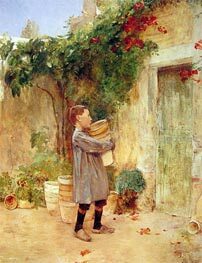 However, he later considered the education he received there "superfluous." 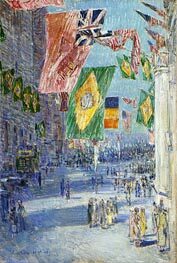 What had a greater influence on Hassam's work was the art he was exposed to in the city's museums and galleries, especially the works of the Impressionists. 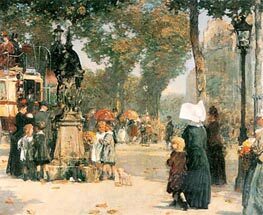 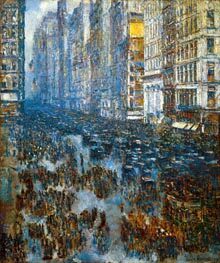 Hassam returned to America and settled in New York City in 1889. 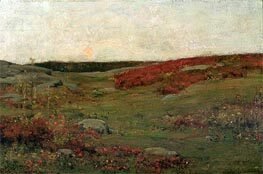 He soon become close friends with fellow artists J. Alden Weir and John Henry Twachtman, whom he met through the American Watercolor Society. 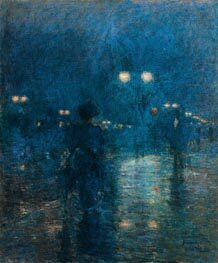 Hassam enthusiastically painted the genteel urban atmosphere he discovered in New York, which he greatly preferred to Paris. 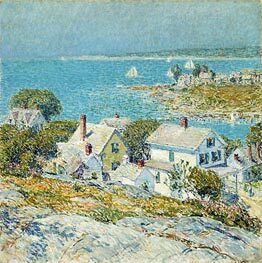 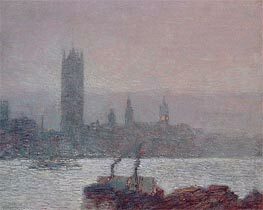 During his time in New York, Hassam made summer painting excursions to Thaxter's home on Appledore Island, Maine, the largest of the Isles of Shoals; and to Gloucester, Massachusetts; Cos Cob, Connecticut; and Old Lyme, Connecticut. 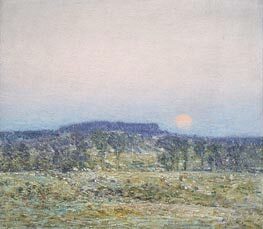 He visited Xavier Martinez in 1914 in his Piedmont gallery to view Martinez' recent paintings of the Arizona desert. 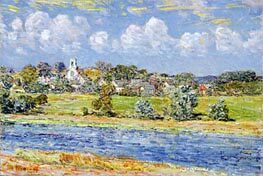 In 1919, he purchased a home in East Hampton, New York. 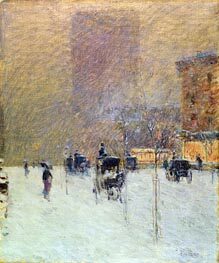 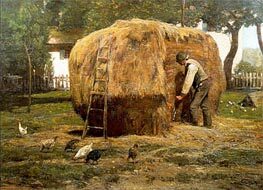 He was a member of the Ten American Painters group, which seceded from the Society of American Artists in 1898.